My friend Viga is still trying to raise money for college. You can get art for helping! Details here, donation site here. Sorry this is so late. Regular posts resume tomorrow. Paul Dukas, eat your heart out. It’s November 17, 2012. The top movie is The Twilight Saga: Breaking Dawn: Part Two, enjoying the first of its three weeks on top, and the top song is still Maroon 5’s “One More Night,” a boring and heavily auto-tuned song, the video of which manages to be almost interesting by dint of showing a woman deciding to leave her husband/boyfriend/whatever while the song is clearly being sung by a man trying to work up to leaving his wife/girlfriend/whatever. In the news, after four days of fighting, Egypt brokers a truce in fighting between Israel and Hamas, which lasts all of a day before rocket exchanges resume; the death of a woman in an Irish hospital due to the hospital refusing to perform a medically necessary abortion provokes international outcry and condemnation; and Hostess files for bankruptcy, choosing to blame union strikes rather than the fact that their alleged “food” products taste like styrofoam. Classy. Meanwhile, “Too Many Pinkie Pies,” written by David Polsky and directed by Jayson Thiessen, returns us to questions that have been left largely unaddressed since “Party of One.” Specifically, it examines the flatness of Pinkie’s usual portrayal, but where “Party of One” did so via character collapse, which ultimately is an attempt to find depth, “Too Many Pinkie Pies” has Pinkie herself confront avatars of her flat persona in the form of her duplicates. This confrontation has the side effect of making the episode also function as a critique of Pinkie Pie’s portrayal in fanworks, which tend either to depict her as a pure fun-seeker with no interior life to speak of or a completely deranged avatar of chaos, with the latter going as far, in some depictions, as violent and disturbed. This ultra-violent “Cupcakes”-style Pinkie Pie is fairly obviously an intentional departure from the character and values of the show undertaken for pure shock value, and thus requires no critique, nor could the show ever seriously acknowledge the existence of such a depiction. Thus, the episode leaves it out, and instead has Pinkie Pie confront duplicates who both are pure fun-seekers and bring chaos to Ponyville. At the beginning of the episode, Pinkie Pie is functioning in her usual persona as someone who exists purely in the moment and seeks immediate gratification. As I discussed in my article on “Party of One,” Pinkie Pie can be understood in terms of Daniel Kahneman’s theory of two selves: she has a fully developed and functional experiential self (that is, the aspect of the self that lives in the moment and seeks experiences that provide immediate, positive stimuli), but a stunted and suppressed remembering self (the aspect that lives in the past, plans for the future, and seeks experiences that build good memories). One of the consequences of this stunting is that Pinkie Pie’s sense of well-being is extremely unstable, as she cannot draw on good memories of the past to get her through less-than-pleasant moments in the present. Here she takes this behavior to its logical extreme, finding herself trapped between two potential fun experiences because she can only pick one, and cannot bear giving up either. The Mirror Pool that she uses is clearly quite dangerous. Other than Granny Pie (who is not only a grandmother, but the grandmother of the Fool, and thus doubly privy to sources of knowledge beyond the ken of the merely wise), the only source of information on it appears to be a book sealed away in Twilight’s library. This is not surprising; the danger of a mirror is that it reflects surfaces only, and so the mirror creates simplistic, flat Pinkie Pies who do not have stunted remembering selves, but rather no remembering selves at all. They must be taught the names of Pinkie’s friends, and are incapable of delaying their pursuit of fun in order to prevent negative consequences, such as the destruction of yet another of Applejack’s barns. They have no memory, and care nothing for the future. In short, they are the standard-issue depiction of Pinkie Pie in fanworks such as the Lunaverse or “Forever!” Oblivious, silly, cartoonish, and annoying, this version of Pinkie Pie is not too dissimilar from her party-obsessed outer persona as seen in the earlier segments of “Griffon the Brush-Off,” “Party of One,” or “A Friend in Deed.” However, it ignores other elements of Pinkie’s character, the hints of greater depths, such as her collapse in “Party of One,” or her Fool-like access to special knowledge, as in “Swarm of the Century,” “Feeling Pinkie Keen,” and this episode. Above all, it ignores that Pinkie truly does love everyone, to the point of keeping up with the lives of every citizen of Ponyville well enough to be able to talk to each and every one of them. Still, Pinkie has probably the shallowest character of the Mane Six (though Applejack and to a lesser extent Rainbow Dash can make claims to that character; certainly Twilight, Fluttershy, and especially Rarity have received significantly more development than the other three up to this point in the series). Her stunted remembering self means she has little answer to the question of who she is; she has (somewhat deliberately) shed most of her past, and thus has little in the way of roots or grounding. As I discussed in my article on “Party of One,” the price of escaping her difficult and dreary past is that she has no stable sense of self-worth, being utterly dependent on constant validation by her friends because her past achievements have no meaning for her. She lacks a stable sense of identity for much the same reason; she cannot be “the filly who grew up on a rock farm,” “the pony who taught the Elements of Harmony to laugh at danger,” “the pony who taught Luna that it can be fun to be scared,” or even “the pony who reunited Cranky Doodle and Matilda,” because those occurred in the past. Nor can she identify herself by her goals, because she has none. All she is is “the pony who is friends with everyone,” and thanks to delegating that to her duplicates, she is no longer even certain of that. Her identity crisis in this episode is thus inevitable; surrounded by living Pinkie Pie memes, she is no longer even sure that she is the real Pinkie Pie. It is thus no surprise that the final test to identify the real Pinkie and weed out the duplicates relies on both Pinkie’s love for her friends and her ability to forgo immediate gratification in exchange for getting to stay in Ponyville, something she desperately wants. The former element of the test depends on a strength that Pinkie possesses that is frequently overlooked in her caricatures, including the duplicates, namely her capacity for love and devotion to her friends. The second element, however, is a strength Pinkie generally lacks, being the hallmark of the remembering self. Her devotion to her friends, however, translates into a determination to stay, and thus for their sake she is able to endure boredom in the present to maintain in the future that which she valued in the past. In discussing “Party of One,” I noted that Pinkie Pie ultimately learned nothing because the structure of the show at the time–in which Twilight and only Twilight writes friendship lesson letters–meant that no one else had room to learn and grow. Here, more than a season later, Pinkie finally gets that chance at growth. Forced to use her remembering side to keep her identity and friendships intact, she has been reminded that she has a remembering side. It has grown just that little bit stronger, and therefore so has Pinkie Pie. Next week: Please no. Not yet. It’s too soon! …So I’m going to delay a week. Next week, something special and My Little Po-Mo related, week after, the next episode. Well, I'd say that sums up the *intended* themes and message of the episode pretty well. Twilight specifically says the spell will “send [them] back where they came from,” so I imagine the worst it would do to the real Pinkie is (depending on how “where she came from” is defined) send her to either the rock farm, or her mother's current location. Due to some quirk in the Youtube recommendations system this was the first episode of the series I saw, and it left quite the impression on me. In the immediate sense it does an admirable job of going against the usual “cloning episode” formula by eschewing the typical runaround trying to figure out which version of the character is the real deal (though that’s effectively how it goes for most of the cast), and making the central conflict about the cloned character’s lost sense of identity, and what she does to try and establish herself as distinct from her duplicates. 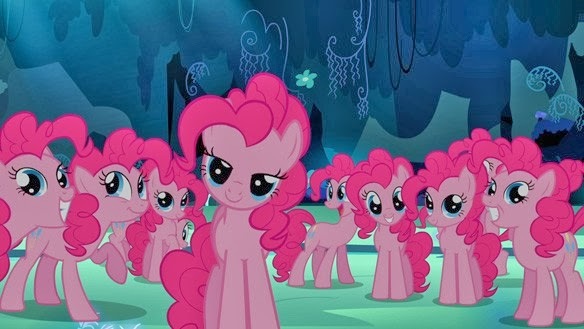 The notion of having a crowd of identical (or possibly superior) duplicates of yourself running around has some heady psychological and philosophical implications that I don’t think are explored enough in any type of media, let alone children’s entertainment where a plot like this is usually a sign of mild exhaustion on the part of the production staff, so the scene of Pinkie willfully allowing herself to get rounded up with the rest of the clones because she didn’t think her protestations of originality would carry any weight – even with herself – really struck a chord. And doing an episode like this with a character like her is simply a good formula, both from the practical perspective that taking your most thoroughly entertaining character and creating a small army of identical copies is probably going to make for a good half-hour of television, and because, as you point out, Pinkie really is the one for whom confronting a myriad of funhouse reflections of herself will generate the most emotional result, both positive and negative. It’s difficult to imagine a character without her particular capricious style of expression pulling off the scene I mentioned earlier with that degree of nuance, both as a really tragic character moment and a wonderful bit of deflated comedy. Going deeper than that, even – the number of interpretations for what she’s experiencing in the episode far outnumber what any other sort of character would go through under the same set of circumstances. You land upon an excellent one here: that her whole existence is one headlong race forward, and even being forced to look at her reflection causes her to buckle under the pressure of what defines her. Another perspective, though, and one that lingered with me after I first saw the episode: the mob of Pinkie clones overruns the town, imposing their surface-level definition of her upon the show – essentially, bending it to her rules, or at least the set of highlights the constitutes fan perception of her. If you want to argue for Pinkie functioning as a “mini-Discord”, this is evidently the episode where she “triumphs” over everything else in the show’s rulebook – and the thing is, she has to confront what it means to have no resistance to her line of thinking. And since, again, much of this is rooted in her perception within fandom, it’s an interesting picture. Think about it – she’s the “wildcard”, the one you inject into the story to liven things up, or at least begrudgingly acknowledge as having that role because it’s one of the things expected of the story. And in terms of the fandom’s obsession with crossing over into everything else, she’s the living embodiment of a good time – the most adaptable to other narratives by dint of her universally narrative-defying qualities, the shortcut to a funny youtube video, the patron saint of brony DJs (and I’ve noticed, in my very brief encounters with that group, that there’s an interesting split between the two styles of electronic music that such producers consider “canon” – the dubstep producers tend to gravitate towards Vinyl Scratch, while the sugar-rush big-room EDM producers load up their tracks with samples of Pinkie. When they’re not all just emblazoning their album covers with rainbows and lightning bolts, that is). In other words, what the fandom gravitates towards in her depiction is everything you single out as definitive of effervescent pleasure-seeking, a reckless abandon and desire for maximum gratification in the immediate moment. Which is all well and good when you’re the only one playing the game, brightening up more serious surroundings. But as the recent dance music boom has demonstrated, having everyone aiming at the exact same pleasure center with the exact same formula – even if it’s an excellent formula – means that only a very small number of the numerous people who are executing it well can thrive, and even then not very long before someone else dethrones them with a minor variation upon it. So when Pinkie’s army of clones enforce their pleasure-seeking upon the show, not only does it wreak inevitable havoc upon the town – it gives Pinkie some competition for her title as anarchist-in-chief. And she’s very, very much not up to the task. So we get an alternate lesson about the perils of trying to stay “hip” (whatever that means) in the face of the inevitable procession of time and style. Pinkie quickly and abruptly discovers that “the kids are coming up from behind”, briefly tries to assert her position of seniority as the original Pinkie, and when she discovers that her newer duplicates consider her an equal at best and a hindrance at worst, quickly resigns herself to a life of playing catch-up. In this view the resolution at the end comes from her realization that her love of her friends outweighs the hatred of boredom she shares with her clones – that, in fact, being the Pinkie Pie that audiences know and love consists of more than her surface characteristics – and this added degree of nuance allows her to outlast her competitors. So kids, remember: feel free to strike out for fame and get involved in whatever wave of the future works for you. But remember that at the end of the day it all comes second to who you are as a person. And if you don’t nurture those qualities enough… well, all I’m saying is it’s possible that someone else might be able to outlast you in the paint-drying contest and take your place in the hearts of your friends and millions of adoring viewers everywhere. So, erm, it’s more important than you may think. P.S. : A heartrending bit of funny circus music that I think is rather pertinent to what I’ve just written, as well as the allure of “show-business” in all its myriad forms. I wouldn’t mind getting losing my soul to the greasepaint (and something tells me Pinkie’s already far past that threshold), but those desires always have to be tempered with the fear of being unable to get it back when you need it most.